Petit was on the wire for a total of forty-five minutes that morning. During that time, he made eight passes on the wire, lay down completely, saluted his onlookers, and even did a little dance. And, as soon as his performance was complete, he was arrested. Mother and daughter hookers, Jazzlyn and Tillie. Although each character’s story is told separately, their lives intersect and overlap in unexpected ways throughout the book. A woman has a support group meeting for mothers who lost sons in the Vietnam War. Later that day, her husband (a judge) presides over Jazzlyn’s and Tillie’s arraignments. Later still, another member of the support group, who lives in the projects with Jazzlyn and Tillie, takes in Jazzlyn’s kids, who have nowhere else to go. I walked toward the projects. A surge of dread. Hard to calm the heart when it leaps so high. As a child I saw horses trying to step into rivers to cool themselves off. You watch them move from the stand of buckeye trees, down the slope, through the mud, swishing off flies, getting deeper and deeper until they either swim for a moment, or turn back. I recognized it as a pattern of fear, that there was something shameful in it—these high-rises were not a country that existed in my youth or art, or anywhere else. I had been a sheltered girl. Even when drug-addled I would never have gone into a place like this. I tried to persuade myself onward. I counted the cracks in the pavement. Cigarette butts. Unopened letters with footprints on them. Shards of broken glass. Someone whistled but I didn’t look his way. Some pot fumes drifted from an open window. For a moment, it wasn’t like I was entering water at all: it was more like I was ferrying buckets of blood away from my own body, and I could feel them slap and spill as I moved. Now, to be clear, I am not suggesting this is poorly written. In fact, I think, overall, the book is very well written (and I’m not the only one—it won the National Book Award for Fiction in 2009 and was hugely, ridiculously hyped that year). But this is only one paragraph of the FOUR PAGES describing a woman’s walk from her car to an apartment. Yawn. Luckily, starting with the second part (at page 167), the pace picks up dramatically. Not only is there more action and more dialogue, but the characters introduced are more varied and interesting, and their voices are more distinct and unique. It is also at this point that the characters’ interconnections start to materialize. McCann weaves a multi-dimensional web among seemingly random and unconnected characters, and this is the book’s biggest strength. It allows us to see characters through different lenses. We meet them (they often tell their own stories in first person), learn why they are special and interesting, discover their pasts, empathize with them, and learn to like them. Then, later, we see how they are perceived (and, often, misjudged or misunderstood) by others. This technique helps establish the depth and complexity of many of the characters. But there are some characters (like the aforementioned Fernando and The Kid) whose roles in this web are peripheral and, by comparison, seem extraneous. The book would have benefited if McCann had chosen not to incorporate so many characters. Who should read it: Linda and Tina (i.e., people who are looking for well-written book-club books with discussion-worthy characters, who may remember Phillip Petit’s daring tightrope walk back in August of 1974). 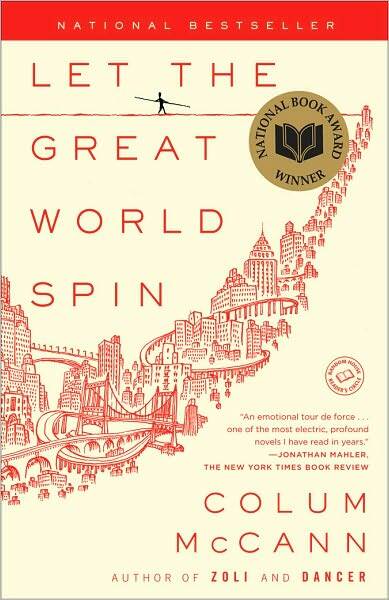 This entry was posted in Rating: 3/5 and tagged Book review, Book Reviews, Books, Colum McCann, Let the Great World Spin, Phillip Petit. Bookmark the permalink.